New Recipe Alert. 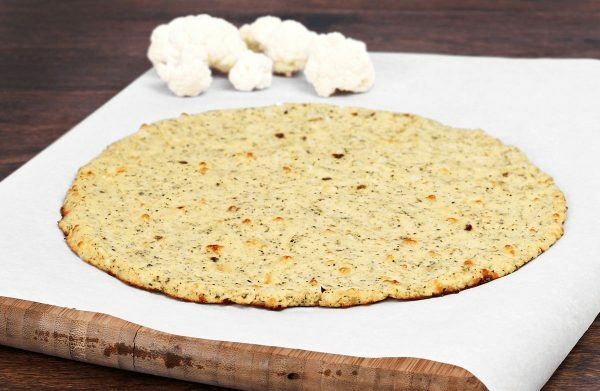 Check out this sinful recipe for Vegan Cauliflower Pizza Crust. Customize it to your liking and add all of your favorite toping. Because a life without pizza, isn’t worth living! A grain-free pizza crust, that’s also free of eggs, dairy and soy. Place the cauliflower florets in the bowl of a large food processor fitted with an “S” blade, and pulse until a rice-like texture is created. Pour the cauliflower “rice” to a large sauce pot, add enough water to cover, and bring to a boil. Cover, reduce the heat and allow to cook for 5 minutes. Drain the liquid, then transfer the cooked cauliflower rice in a freezer-safe bowl. Place in the freezer to cool for 10 minutes. Set aside and allow the mixture to thicken. Remove the cooled cauliflower rice from the freezer and transfer it to the center of a thin dish towel. Use your hands to squeeze the rice in the dish towel, removing all of the excess moisture from the cauliflower. Place the drained cauliflower in a large bowl, then add in the vegan egg mixture, the almond meal, the additional tablespoon a ground flax or chia seeds, theTrader Joes Onion Dip Mix, salt, garlic and dried oregano. For best results, press the crust together firmly, making sure that there are no “thin spots” where it might crack. Add Any ingredients/toppings you'd like and return to the oven to complete your pizza. You can skip the cooking and cooling process when using frozen cauliflower. Simply allow the frozen cauliflower to thaw in your fridge overnight, which creates a “cooked” texture without having to do the extra work. Pulse the thawed cauliflower to create the rice, then drain well using a dish towel.